I’ve recently been reminded of a great way to save more money is by waiting til the last minute to purchase. I want to share with you different areas that you too can save more money but just holding your horses and delaying the purchase. Of course this doesn’t work in every situation, but if it can fit into your schedule and you’re flexible, you can save some real change. Tee times. A good friend of mine played 18 holes of golf today and got a cart for $20. Now, for those of you who aren’t golfers, you may be thinking, “you paid $20 to smack a ball around a corn field? !” But in reality, $20 to play a regulation sized golf course today is actually a pretty good deal. Most decent 18-hole golf courses here in the Minneapolis area charge between $35-80/round – which often doesn’t include a golf cart (FYI, a golf cart along can be anywhere from $10-15/per player). 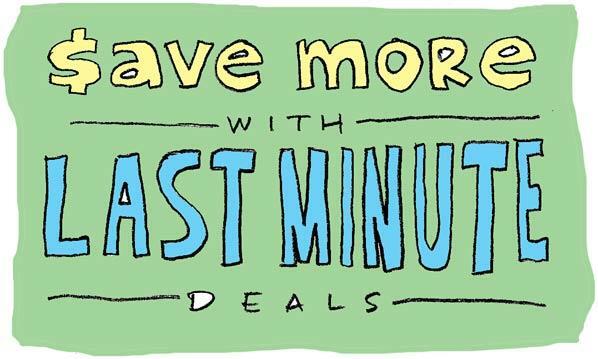 To take advantage of last-minute golf deals, I often use GolfNow.com‘s “Hot Deals” section to grab anything last minute. The only down-side to using their site is they collect payment upfront and tell you it is non-refundable. However, I have heard that if you need to cancel and call the course as soon as you can, they’ll refund the money to you directly (instead of going through GolfNow). Theater performances. I learned about last-minute theater deals several years ago when on an outing with a church group. We all arrived minutes before a performance to grab tickets and were able to all get in at about 40% off the regular price. And as you probably know, going to the theater isn’t a real cheap ticket – so this type of discount makes a huge difference. Here in Minneapolis, the Guthrie offers “Public Rush Tickets” for those brave enough to gamble at grabbing a last-second ticket (Not recommended for that first date). Plane tickets. Many of us need to have our travel plans set in advance – but if you are more flexible and have been wanting to make a trip to see a relative or friend – and could take off at a moment’s notice, the last-minute airfare deals may be just for you. I’ve personally never gotten a plane ticket at the last second – but would be interested to hear from those of you who have. Hotel rooms. Speaking of travel – if you need a place to stay, it could be beneficial to wait til later in the evening to book a room. I’ve sometimes had luck with bargaining the price of a hotel room by arriving late because most hotels just want to fill their rooms for the evening. If you tell them you are shopping around the area for the best rate – they may just offer you a bargain on the spot to stay. Game tickets. My brother and I would sometimes head down to an NFL game after it had started and try to get into the game. Often their are folks outside the gates looking to get rid of tickets. Rather than getting nothing for them, they will often offload them for less than the purchase price of the ticket. Of course the downsides to this are that you might not find a person willing to make a deal AND the seats could be pretty lousy. One time my brother and I ended up behind a large post. Another place to check is Craigslist. Often there are folks who have listed their tickets because of scheduling conflicts and aren’t looking to make a profit. Thank you for sharing these amazing info! I didn’t know at all! Agree Travis – has worked for us before too. Thanks!